The one pile is all my current projects that I'm trying to finish up. 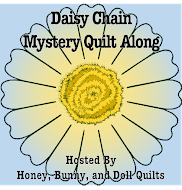 I have actually finished quilting one top today, and have another that I want to work on tomorrow. I was actually glad to get all that random paperwork filed and put away. I found several receipts that I thought I had lost, so put those away along with some other odds and ends. The doll is now sitting on the bed, a much better place for her. I switched my storage cabinets to the spot under the window. It makes it a lot easier to open the curtains, and just feels less crowded this way. I cleaned off the bed as much as I could, and piled the things I need to have out as neatly as posssible. 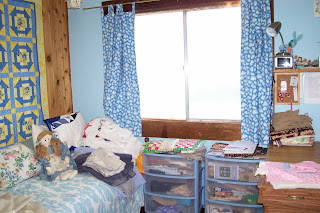 When I get rid of the bed I would like to add some shelving in that area, or perhaps leave it open and create a design wall there. I moved the cutting area by the closet. It does block some access to my closet, but it's on wheels so it easy to move when I need to get in there. 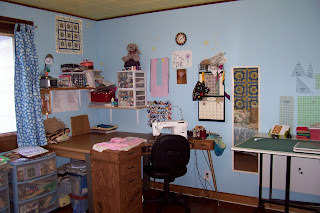 I like it because it is right where all my rulers are hung, so it makes it easier to use them, I'm not always haveing to go back and forth across the room. It's also easier to use for basting because I can just pull it out into the center of the room and still be able to walk all around it. I am so pleased that I took the time to clean up a bit. It really is easier to work in an organized area that is attractive. 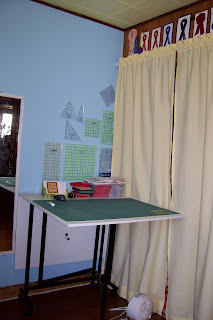 My next clean up project will be the inside of my fabric storage are. It's past time that I take care of that! Doesn't it feel good to clean and sort through your stuff? 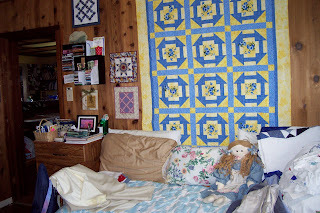 The blue & yellow quilt hanging on the wall is gorgeous!